Our market research uses the most advanced implicit and explicit research techniques, coupled with a fundamentally more accurate model of decision making, to provide deeper insight and more valid forecasts of consumer behavior. Humans behave contrary to rational economic theory, using heuristics and emotion as guides to navigate the steady stream of choice options flowing non-consciously through our minds. This poses a problem for those looking for deep insights and accurate forecasts of behavior. 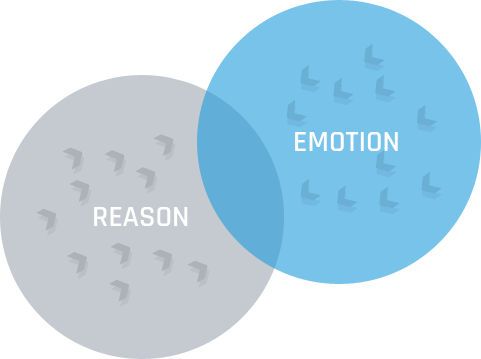 Fortunately, the Proportion of Emotion Model™, published by our founder and chief behavioral scientist, Aaron Reid Ph.D., now provides a mathematical model of how emotion interacts with reason-based trade-offs to determine behavior. Traditional brand tracking is broken. Non-differentiating, flat-line conscious metrics that are not predictive of sales have lost luster among executives. Sentient Brand Tracking incorporates the critical implicit and explicit drivers of your brand equity to reveal actionable business insights. Who loves your brand implicitly and why? We reveal the emotional associations people have with your brand, and the conscious and non-conscious brand attribute associations that drive your brand equity, to help you differentiate your brand with the right emotional messages. Understanding where and how to extend your brand is a critical first step in the innovation process. Sentient brand extension research quantifies the business demand as well as the brand fit of your best brand extension opportunities. Sentient Subtext™ advertising testing reveals the implicit effectiveness of your ads. Sentient Prime implicit research technology, coupled with eye-tracking and biometrics, provides diagnostic data on the points of strength and the ability to impact brand associations in consumer minds. Package Pulse™ tests the effectiveness of your new package designs on the ability to evoke emotion, reinforce key brand associations, stand-out against the competition on shelf, and deliver sales results. Tired of conscious concept tests that give little basis for the red lights that squash your new innovations? Concept Pulse™ provides the precision of implicit evaluation combined with emotional market demand to reveal the hidden promise in your soon-to-be winners. Sentient customer satisfaction research determines the discrete emotions that customers associate with your company, brand or product, and reveals the key touchpoints responsible for triggering those emotions. These insights lead to stronger satisfaction, likelihood to recommend, and customer loyalty. Sentient holds deep expertise in the use and integration of multiple advanced behavioral science based research methods, including: implicit association testing, biometrics (e.g. skin conductance response, heart rate), electroencephalography (EEG), eye-tracking, and choice based conjoint techniques.